For use in large volume cell fusion applications such as hybridoma production, the ECM 2001+ generator, 2 ml optimization coaxial chamber, and 9 ml production coaxial chamber are used. 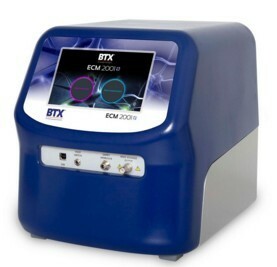 This system (98-6169) does not require proprietary fusion medium, but can be used with the Cytofusion Medium Cfor convenience. Coaxial chambers (47-0030, 47-0020) are also available for purchase separately.